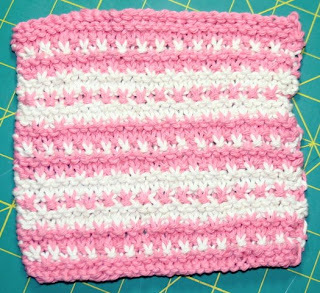 This pattern is from a Yahoo group I'm in that walks us through 2 different dish cloth patterns each month. I'll definitely try out this stitch pattern again. This is a notions bag... I'm not sure I like it but I can't quite decide. I used the directions I found in a book for an "exposed" zipper since I quilted the fabric I used to make it nice and firm to hold it's shape. I'll make another one, just not sure what I'll change first. 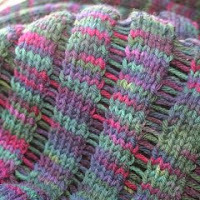 I am in L O V E with this yarn - cascade paint! I have started the Clapotis I am making. 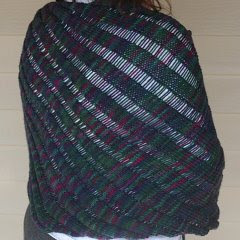 I'm using Cascade 220 Paints yarn and the pattern from Knitty. The yarn is really beautiful and I love the fact that it isn't striping. You can see on the very tip of the Clapotis where I started out using markers. It was taking so long I didn't think I would EVER be done. I then used the tip from the Ravelry group and made the stitch that will be dropped later a Purl stitch. This made it so that I could remove the markers and my speed increased very dramatically. The piece in my hand is what I did with the markers... the rest of it was done in a similar time frame but is a lot bigger. I seem to be cruising along now. I am really loving the texture in the Clapotis and can't wait until my first dropped stitch.